Was Fuentes’s Move a Balk? Discussing balks is different from discussing almost every call made by major league umpires. For balls and strikes, there is an objective rulebook strike zone; for fair and foul, the line is clearly drawn; for base-out calls, if either the player or the base (if a force play) is tagged before the runner touches the base, he is out. All of these plays are objective. However, the balk call is more of a subjective animal. 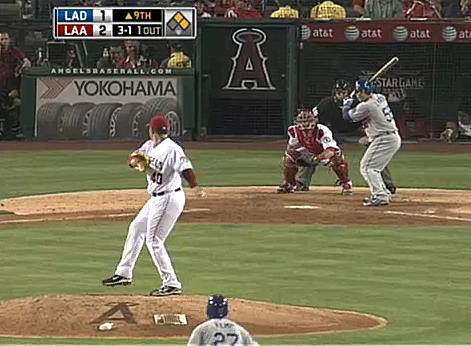 With that in mind, let’s take a look at another play from the Dodgers-Angels game from last night: Brian Fuentes’s pickoff of Matt Kemp in the top of the 9th inning. Watch the video here. 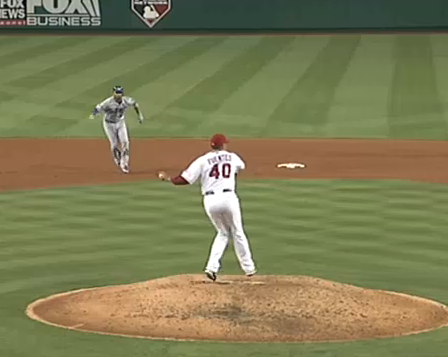 As soon as I saw this play, I felt it was a balk, but feelings were mixed. Given that the balk rule is very complicated – rule 8.05 has 13 subheadings and a comment with two more subheadings – I figured that I should really analyze this closer to make sure. However, I believe rule 8.05 (a) clearly defines this pickoff move as a balk. First, let’s take a look at a snapshot of the motion in question. 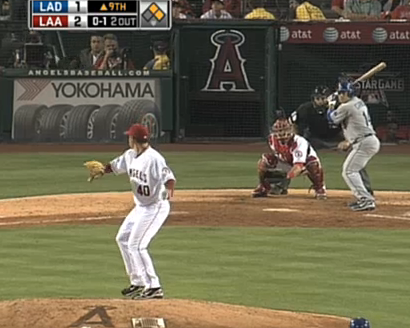 Now, let’s take a look at another Fuentes pitch, this one taken from the final at-bat of the game. These are two remarkably similar images, and I would say that this for certain violates rule 8.05 (a) and the penalty should be a balk. There is also a convincing argument to be made that Fuentes violated rule 8.05 (c) as well, after the jump. Rule 8.05(c) Comment: Requires the pitcher, while touching his plate, to step directly toward a base before throwing to that base. If a pitcher turns or spins off of his free foot without actually stepping or if he turns his body and throws before stepping, it is a balk (emphasis mine). This one doesn’t appear to be as cut and dry – to me, it appears that he spins without actually stepping, although he does eventually step to finish the play and he does execute the step before the ball is released. Still, this spin seems, to me at least, to be in violation of rule 8.05 (c) as well. Regardless, there was a clear violation of MLB Rule 8.05 (a) in this pickoff, as the beginning of this motion was effectively a carbon copy of Fuentes’s typical pitch delivery. 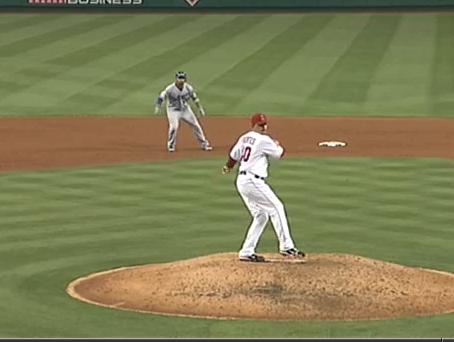 There is no doubt in my mind that this play should have been called a balk. Instead Matt Kemp was called out, costing the Dodgers just over 20% in win probability in a tight game. We hoped you liked reading Was Fuentes’s Move a Balk? by Jack Moore! I vote balk. Also, I like FanGraphs w/ pictures. Incorporates the human element! Agree on both accounts. Graphics really liven up the article and add a few natural breaks to the article. Good stuff. Which is funny, as it’s well known that Jack Moore is the pseudonym for a computer being designed in the labs of the Univ. of Wisconsin.